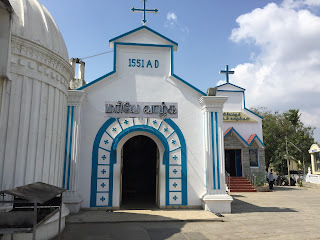 Following on from my recent post about St Thomas Mount, this one explores another key Thomas location, Little Mount (Chinnamalai), also in Chennai. 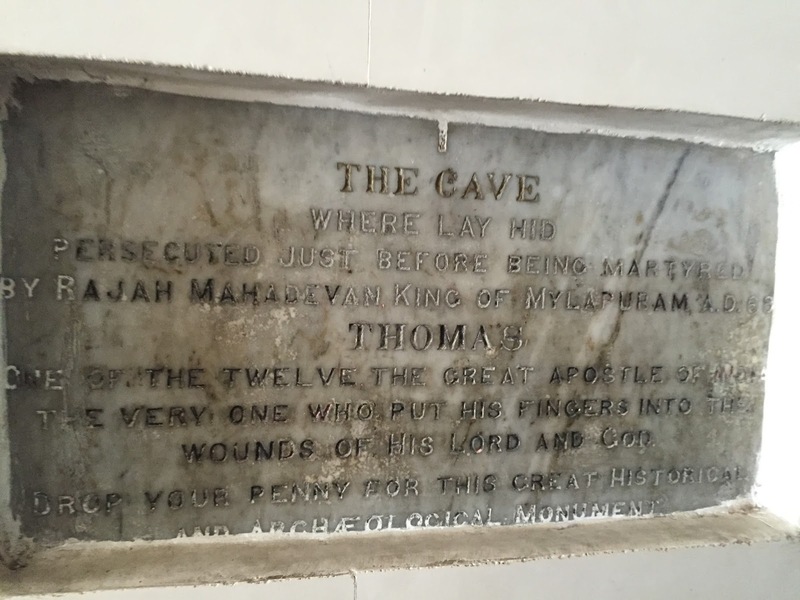 It's the place where Thomas allegedly faced his death, and the church is built over the cave where he hid from persecution. The site itself is tucked away down a side street (the "L.D.G. Road") with no sign-posts in sight. It caused my driver some degree of stress, to the point where I eventually got out of the car and walked. I could see where it was on my Sat Nav on my phone, but he was not inclined to trust it. "Little Mount" really is only a few steps up from the road, and is nothing like the climb up to St Thomas Mount. 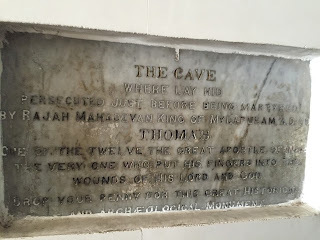 Although it is the large round twentieth century church that makes the big impression, it's the old chapel built by the Portuguese in 1551 that houses Thomas's cave. 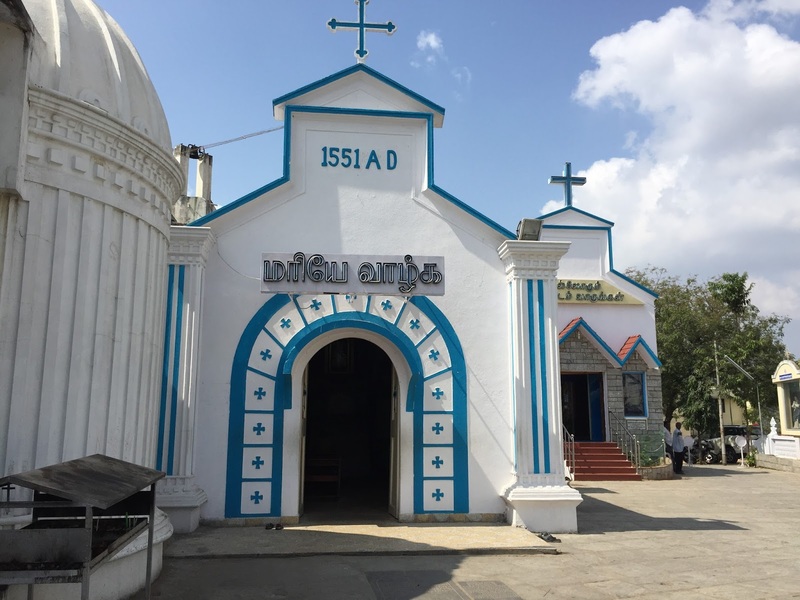 The chapel is small, but pleasantly cool if you are visiting on a hot day. 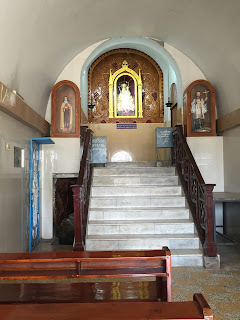 A few pews look up towards a shrine of the Virgin Mary, but down to the left is St Thomas's cave. I did not try recording in the chapel or the cave, not least because a gentleman hovered around me looking anxious when I had my phone out. But I did manage to grab a couple of quick pics. There's a nice old explanatory placard before you go down to the cave. It's just the kind of thing one wants to see on these occasions. The cave where lay hid persecuted just before being martyred by Rajah Mahadevan, king of Mylapore, A.D. 68, Thomas, one of the twelve, the great Apostle of India, the very one who put his finger into the wounds of his Lord and God. Drop your penny for this great historical and archaeological monument. 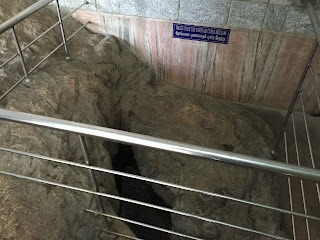 While I was there, a woman went down into the cave to do some sweeping (I have seen a lot of women sweeping in India) and to collect up the pennies that had been dropped. The cave itself is not for the claustrophobic. It has a proper bend-down-low entrance. 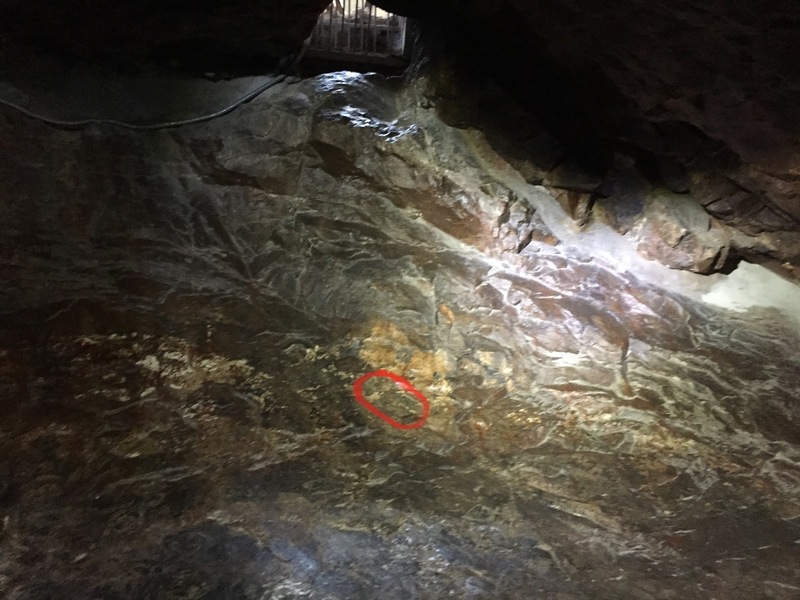 There is a small shrine inside the cave, and a red circle marks the spot where Thomas was allegedly martyred. The cave is without doubt the major attraction. I wondered whether it gets horribly crowded at busy times. I was happy to have it to all to myself. 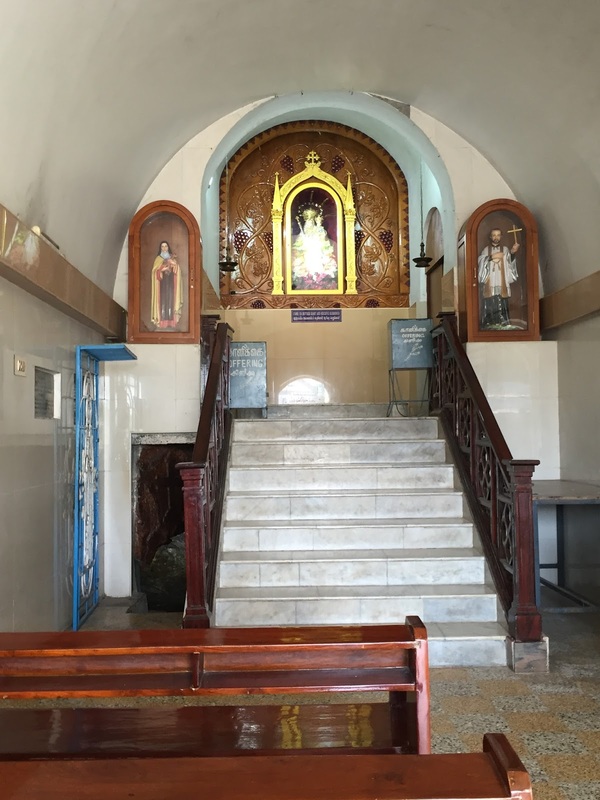 There were several praying in the chapel while I was there but none went down to the cave. I think I may have been the only tourist type there. 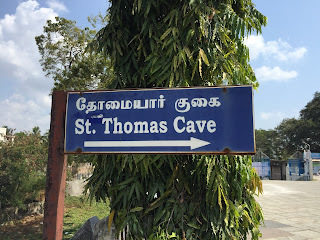 While I was sitting outside the chapel, by this sign pointing to "St. Thomas Cave", a gentleman approached me and pointed to "water". I thought he was worried that I was overheating, but in retrospect, I think he may have been directing my attention to the miraculous spring. 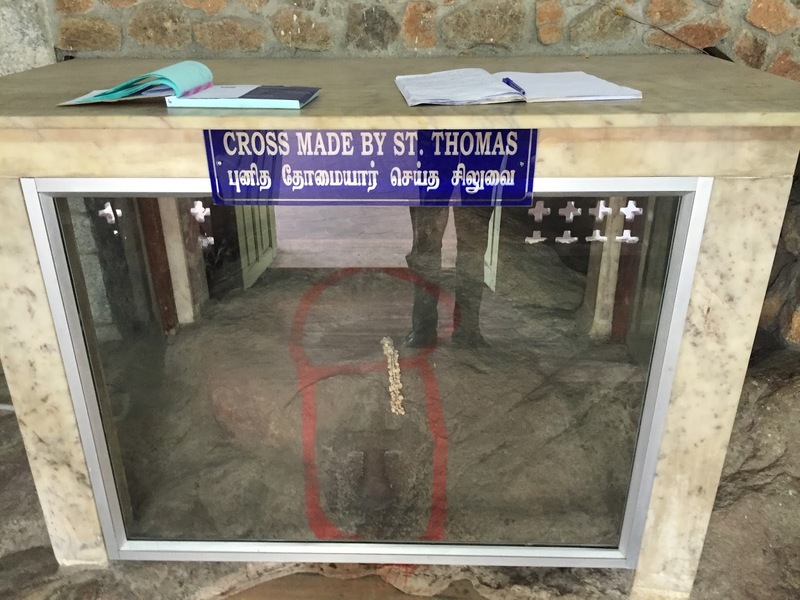 On the way there, one sees a rocky feature that draws attention to Thomas's footprint. Up a few steps, one enters a separate chamber that has two key features. This is one -- a fountain with water that "cures diseases". 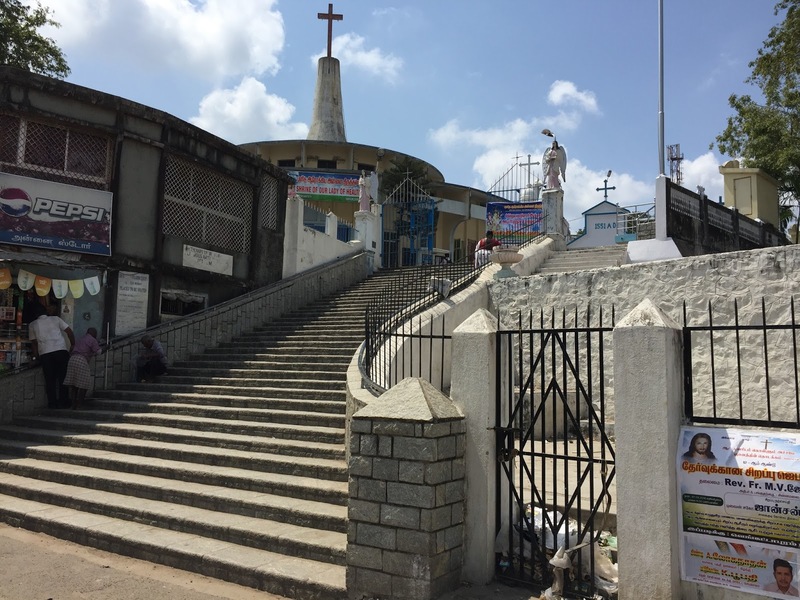 The water is now behind bars and presumably inaccessible to present-day pilgrims. The other is also a rocky crag, and it features a cross that is cut out of the rock. This cross is behind glass and has the header "cross made by St. Thomas". Above it is a sign that says that the cross bled for many years in the 16th and 17th centuries. There was a lady hovering around me the whole time that I was looking at these things, and I realized after a while that she was waiting for a contribution. It was rather a formal process -- she wrote it all down in her book and handed me a receipt. But once given, she allowed me to take my pics and do my recordings without hassle. 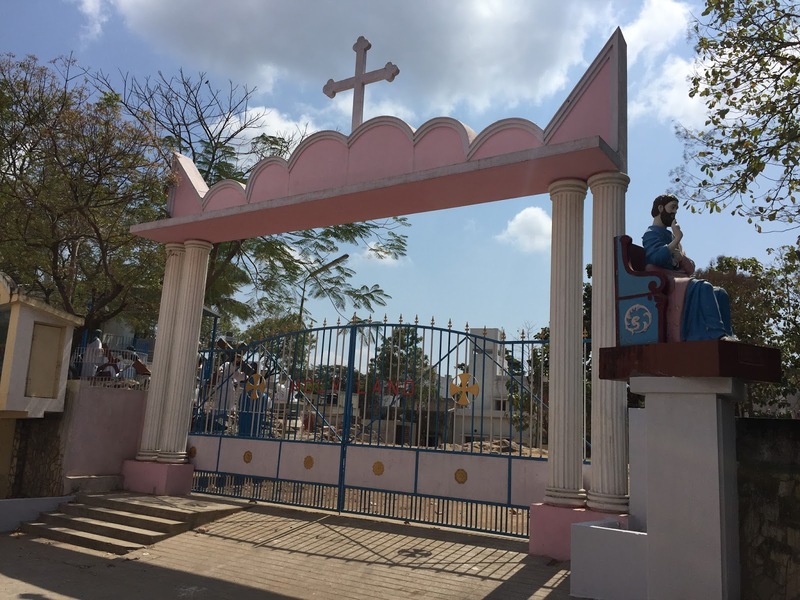 Little Mount also has a park it labels "Holy Land", accessible through some large pink gates. The idea of the park is that it imitates Jerusalem, and features colourfully represented elements from the Passion Narrative. The most striking of these is a trial scene featuring Jesus (with a red robe and a green crown of thorns), a centurion and two black elephants! These last two posts were so cool! Best of luck during your travels. Thanks, Alfredo! There's another one coming.